In late 1978, without realizing it, the creators of the long-running television series M*AS*H created one of the first ever first-person videogames. All I really want from a videogame is to feel like a body in a world – even a damaged and unusable one. Helen and I are currently watching M*AS*H from start to finish. We’ve both seen plenty of episodes on TV at one time or another ­- there seems to always be at least two different channels playing random episodes on a daily basis – but we wanted to see how it held up as a proper, progressive narrative. It has its inconsistencies, especially in the earlier seasons, but largely the series does a remarkable job of painting the everyday lives and places of the 4077 Mobile Army Surgical Hospital. We are currently nearing the end of season seven, having watched roughly three episodes a night for the past many months. By now, I can draw a rough mental sketch of the layout of the 4077. I know where The Swamp is in relation the mess tent. 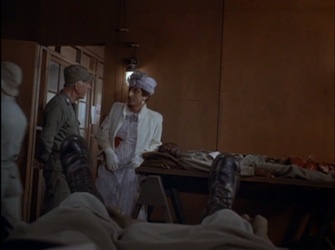 I know where Colonel Potter’s office is in relation to post-op and the surgery theater. I could (if I dared) walk with my eyes closed from the Officer’s Club to Major Houlihan’s tent. As a series of spaces, I know how the 4077 works. Across dozens of episodes, I have had ­(please excuse the pun) a hawk’s-eye view of the 4077, but before watching the season seven episode “Point of View,” I had never experienced the 4077 as a singular, continuous place. “Point of View” is one of M*A*S*H’s many experimental episodes and it is one I had never seen before last week. 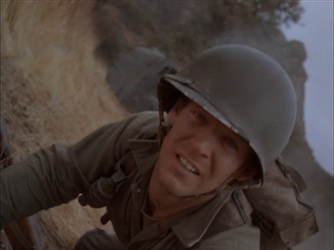 The entire episode is filmed from the first-person perspective of an American soldier who is wounded by artillery fire. As viewers, we don’t just follow this soldier’s journey from the battlefield to the helicopter to the 4077 surgery to post-op, we live it through the soldier’s own body and subjective viewpoint. Other characters look into the camera as they talk into “our” eyes, or just below the camera to work on our wound. 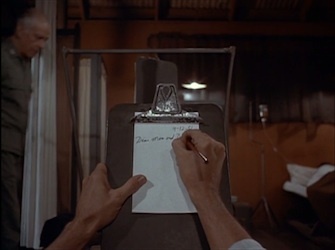 Our arms stretch up to write a note on a notepad because our throat wound is preventing us from talking. As viewers, we never leave the perspective of the wounded soldier’s body and the way we experience the space of the 4077 shifts dramatically. In the countless episodes already watched, the same scenes would be seen from the same angles by the same camera. In “Point of View” the setting was the same, but the way we saw it changed dramatically. In an early scene, we watch from the soldier’s eyes on the side of the descending helicopter as the ambulances and jeeps rush up to the landing pad. We sit there and look at the spinning blades above us as a deluded-looking man in a Hawaiian T-shirt tells us we will be okay and a cross-dresser helps load us into a jeep. In one of the most powerful scenes in the episode, Radar rides the jeep with us all the way from the helipad to the surgery. We hardly see any of the 4077 camp, just the points of tents and flagpoles in the corners of our vision as the jeep drives past. But there is the undeniable sensation of moving through the camp – not as a series of set pieces, but as a continuous camp. Later, we are sitting in triage but the usually familiar faces of the 4077 are now just fleeting blurs as they dash in and out of different doors, talking in the background. It feels so weird, so constrained, to not be able to follow them as I would in any other episode. Regardless of how familiar everyone and everything in the 4077 is to me as the viewer, being bound to and trapped inside this outsider’s body makes me feel like an outsider. Even the usually familiar face of Captain Pierce is terrifying and alien as he stands over my body while I lie splayed on an operating table. In videogame play, we never experience a world from an unmediated, omniscient point of view, but always from an embodied, subjective perspective. Even in a real-time strategy game, looking down on our units and armies, there is a certain, specific point of view that we can’t step out of. We have a body, and through that body we experience the world. Take a first-person shooter like, say, Half-Life, and enter the console command (/noclip) that lets you fly around the map and through walls. It no longer feels like you are playing a game but simply moving a camera around and through a 3D model. First-person games feel powerful because we are not just a floating camera with a gun sticking out of it, but an embodied, subjective perspective – a bag of virtual meat constrained and afforded by the world, a specific angle of looking at a world defined as much by what it can’t see as by what it can. Watching “Point of View,” I felt like I was playing a videogame; it evoked the same emotional response as do most videogames. I felt like I was experiencing another world through a body that is not my own. The lack of a controller in my hands hardly countered this feeling. For the majority of the episode, the soldier is restricted in his movements and his speech due to his injuries. I felt constrained not by the lack of controller in my hand, but by his actual bodily constraints. The reason I couldn’t move wasn’t because M*A*S*H isn’t interactive, but because my virtual body was stuck in a hospital bed. Earlier this year I spoke to Dear Esther’s designer, Dan Pinchbeck, about what the idea was behind that game. He said that they wanted to see how much traditional gameplay they could remove and still keep a gripping, emotive experience. I think Dear Esther succeeded tremendously, but “Point of View” makes me wonder if they could’ve removed even more than they did and still have been left with an engaging experience. Give me a hospital bed and the ability to do nothing but turn my head side to side as things happen around me. All I really want from a videogame is to feel like a body in a world – even a damaged and unusable one. Read more of Brendan Keogh’s bedside tweets @brkeogh.